Media captionPenny Mordaunt: "We're not going to be consulted... they are going to join, it's a matter of when"
David Cameron has said claims the UK would not be able to block Turkey joining the EU are "very misleading", insisting the UK retains a veto. Earlier defence minister Penny Mordaunt said the migrant crisis would hasten talks over Turkey's EU bid and the UK was powerless to stop it. The EU referendum was the "only chance" for the UK to have its say, she said. But the prime minister said this was "absolutely wrong" and raised questions about the Leave campaign's judgement. It would be "literally decades" before Turkey was deemed ready to join, Mr Cameron said, pointing out that the UK and every other EU member must agree - as well as 28 national Parliaments - to this happening. With just over four weeks to go to the 23 June referendum on UK membership, NHS boss Simon Stevens has said leaving the EU would be damaging for the health service, while the Remain campaign has said food prices would rise sharply in the event of a vote to leave. Talks with Turkey, which first applied to join the then European Community in 1987, have stalled amid concerns about the pace of economic reform, its record on human rights and free speech as well the legacy of its 40-year partition of Cyprus. The island of Cyprus has been divided since the Turkish military invaded the north in 1974 in response to an Athens-inspired coup, and the EU has said Turkey must recognise the Cypriot government and open up Turkish ports and airports to passengers and trade before joining. Turkey must get the approval of the 28 member states at the European Council and the European Parliament. It would then need to be ratified by national Parliaments, giving the UK a second opportunity to potentially block a deal. Reality Check: Are 5 countries about to join the EU? Will Turkey's EU hopes affect UK vote? Media captionDavid Cameron: "Britain and every other country in the EU has a veto on another country joining. That is a fact"
But Leave campaigners say an agreement earlier this year between the EU and Turkey on tackling the migrant flow across the Mediterranean, to which the UK signed up, had also injected new impetus into its membership bid. Mr Cameron's insistence the UK could block Turkey from joining the EU followed junior Armed Forces Minister Ms Mordaunt telling the Andrew Marr programme that it was a question of when not if this happened. She seemed to suggest the UK's existing power of veto over the accession of new EU member states would not be a barrier. "It's very likely that they will join, in part because of the migrant crisis," she told Marr. "Britain doesn't [have a veto]. I do not think that the EU is going to keep Turkey out. I think it is going to join." Ms Mordaunt complained that it was dishonest "to have a policy of expansion and at same time deny member states what they need to mitigate the security risk that comes with it". "If you are going to pursue an expansion policy, you have to allow us the tools to protect our own interests, to protect our national security. That we do not have," she said. She added: "This referendum is going to be our last chance to have a say on that. We're not going to be consulted or asked to vote on whether we think those countries or others should join." The Leave campaign has warned if Turkey and six other countries - Serbia, Albania, Bosnia-Herzegovina, Montenegro, Kosovo and Macedonia - who are aspiring EU members - were allowed to join, free movement rules within the EU could see many of their citizens seek work in the UK and could lead to a five million increase in the UK's population by 2030. A million Turks could potentially come to the UK within eight years of joining, they have claimed, a scale of migration that would run the risk of enabling murderers, terrorists and kidnappers to enter the country. Successive British government have been, in principle, in support of Turkey joining the EU if it meets the criteria, a position endorsed by Mr Cameron several times since he became prime minister. But the mood music has changed in recent months. Mr Cameron said that at the current rate of progress it would be the "year 3000" before Turkey joined. "It would be decades, literally decades, before this had a prospect of happening and even at that stage we'd still be able to say no," he told ITV's Peston on Sunday. "This is a very misleading claim about Turkey. Britain and every other country in the EU has a veto on another country joining. That is a fact. "And the fact that the Leave campaign are getting things as straightforward as this wrong, I think should call into question their whole judgement into making the bigger argument about leaving the EU. "They're basically saying vote to get out of Europe because of this issue of Turkey that we can't stop joining the EU. That is not true." 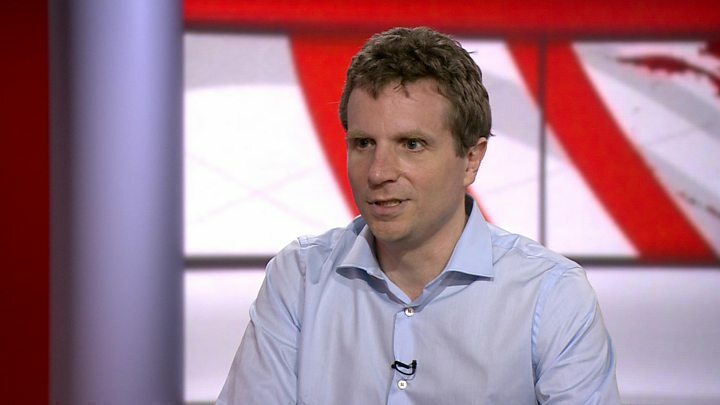 Damian Chalmers, professor of EU law at the London School of Economics, said the UK effectively had a "double veto". He told the BBC "we are talking many many years" before Turkey would be let in. But Leave campaigners argue the UK has shown itself unwilling to challenge the pace of EU enlargement in the past, such as when 12 new countries joined between 2004 and 2007, and would be unlikely to do so in the future. UKIP leader Nigel Farage said Mr Cameron had been a strong supporter of Turkish membership in the past, tweeting: "Veto? Mr Cameron has said he wants to pave the road from Ankara to Brussels." A leading Turkish politician has urged the EU to clarify its intentions vis a vis Turkey. Binali Yildirim, who is set to be the country's next prime minister, said on Sunday "confusion over Turkey's full membership and the migrant issue has to be brought to an end". "It is time for us to know what the EU thinks about Turkey," he said. EU referendum: Will Turkey's EU hopes affect UK vote?